Gerardo Parra is going to be traded. There’s little doubt about that. He’s going to be moved because he’s the hottest hitter on a terrible baseball team. That’s as simple as logic gets. But for some reason, there are Brewers fans out there who think Milwaukee should sign the outfielder to an extension. First of all, I can’t believe there’s more than one person who thinks this, but there is, just look on Twitter. Second of all, I can’t believe people think his production this season is actually sustainable. Therefore, it’s time for a little Gerardo Parra perspective. Despite what his fielding stats say in 2015, Parra is a top-tier outfielder. He won a Gold Glove in 2013 and can play every outfield position with the best of them. The majority of his career WAR total comes from his defense, because, up until this season, Parra’s offense has been suspect. Before the season commenced, Parra owned a career .326 on-base percentage and an 89 wRC+ as a six-year major leaguer. His only above-average season came in 2011, which is the only time he ever posted a wRC+ over 100. With a lack of power and too many ground balls, Parra has never been a “good” hitter. Parra ranks 26th in wRC+ (135) and 23rd in wOBA (.371). His .193 ISO is by far a career high, and with two more home runs, he’ll also break another career mark. Parra’s BABIP is also a best, sitting at .360. When putting everything together, Parra has been one of the very best hitters in all of Major League Baseball. That’s right. Gerardo Parra, the player the Brewers got in exchange for a very fringy outfield prospect in Mitch Haniger and Anthony Banda, has been a better hitter than the likes of Michael Brantley, Kris Bryant and Adam Jones. Does anyone really think Parra suddenly turned on a switch and became a top-30 hitter in baseball? To sane people, the answer is obviously no, but the people with brains in their heads aren’t who this article is targeted at. It’s directed at the insane. In other words, I’m hoping insane people read this. 2015 has been an amazing offensive season for Parra, but it won’t last. And even he probably knows this. We have six years of sample size to determine this, and even though Parra, who just turned 28, has entered his prime, thinking his prime is that of an amazing hitter is crazy talk. He’s been really, really good for 326 plate appearances this season, but in all likelihood, Parra will revert back to an amazing outfielder but just an OK hitter when 2016 hits. His performance will earn him a bigger free agency contract than originally thought, but it won’t be that of a perennial All-Star. And it shouldn’t be. Parra will be traded by the Brewers, and it is absolutely the right decision. This entry was posted in Trade Talk and tagged Gerardo Parra, Milwaukee Brewers on July 25, 2015 by Justin Schultz. We are now at the All-Star break, and for teams sitting at the bottom of the standings, like the Milwaukee Brewers are, it’s a welcome furlough. The four-days off is also usually the beginning of trade season, as teams are either getting ready to stack up for a postseason run or start shedding veterans in order to ignite the rebuilding process. In case you don’t know anything about anything, the Brewers will be doing the latter. At 38-52, they have the second-worst record in Major League Baseball. They are officially sellers. Milwaukee is currently in possession of a handful of players who contending teams should be calling about. They have veterans with expiring contracts, but they also have players who are on the cusp of their primes, making them extremely coveted. The Brewers won’t trade their entire roster (even though I’m not against the idea), but it’s safe to say they’ll be sending a few players out of the city known for its beer. So let’s make some predictions. OF Gerardo Parra – Numerous teams are in need of outfield depth (see Kansas City), and with the way Parra has performed offensively, his name is one of the hottest on the block. Of outfielders with at least 300 plate appearances, he has the 13th-highest wRC+, not to mention his on-base percentage of .344 would be his best mark since 2011. Parra is as good as gone. SP Kyle Lohse – I know his ERA and everything else you can possibly look at is downright terrible, but I still have this feeling that a team is going to take a flyer on him, for the right price, of course. The Brewers won’t get much back and they’ll probably to have pay some of his remaining salary, but with Lohse being a free agent after the season, why wouldn’t a team in need of a back-end starter go after him? 3B Aramis Ramirez – Every team needs hitting and Ramirez can still provide that at 37 years old. He’s a notorious slow starter and this season was definitely no exception. His numbers are finally beginning to improve, however. After producing a .272 wOBA in June, he crushed the ball in July and finished the month with a .366 wOBA. He, like Lohse, is in the last year of his contract (and career). He’s a rental who a team will trade for. 1B Adam Lind – He’s been the best player on the Brewers in 2015 and is probably the best hitter on the market. He’s already put up 2.1 WAR while creating an impressive 43% more runs than league average. Lind could bring back a fairly decent haul, especially compared to the other guys I listed above. If a team is looking for a high OBP player who hits home runs, Lind is the man for the job. RP Francisco Rodriguez – I’ll admit I was wrong about Rodriguez. I thought he would be equally as bad as he was in 2014, but as it turns out, he’s been lights-out. His strikeout rate (30.8%) is back in line with his career norms and he’s no longer getting bit by home runs. He would be a very valuable add to a bullpen in need of a high-leverage reliever. The only thing stopping a team for making a play for him is his big contract. He’s owed $7.5 million in 2016 with a $6 million club option in ’17 ($2 million buyout). That’s a lot of money for a closer who’s been up and down in the past few seasons. Still, I think the Brewers will trade him yet again, but this time, there will be no reunion between the two. OF Carlos Gomez – The Brewers should trade him, but I think they’ll wait another year. They need to be able to sell tickets in 2016, in spite of the talent-less roster they’re sure to put together, and people will pay to see Gomez. I feel like that is a terrible reason not to trade someone, especially since his value now is higher than it will be next year, but it’s what the Brewers will presumably do. C Jonathan Lucroy – Lucroy’s going to stay in Milwaukee as well. The Brewers will have to be unbelievably blown away in order to trade a great catcher with a team-friendly contract like Lucroy. I think Lucroy will be involved in a mid-season trade next season, but not this one. RP Jonathan Broxton – Making the playoffs and doing well once you’re there is nearly impossible without a quality bullpen. Basically everyone is looking for bullpen depth. By old-school numbers Broxton has been less than quality in 2015, which is why I don’t see him being moved. The Brewers would get next to nothing in return for him. so maybe their mindset is, why bother? SS Jean Segura – I struggled with Segura. I can easily see him being traded, seeing as how Orlando Arcia is coming for his job. But which team is going to give up what the Brewers demand for him? That’s the big question here. Segura is a young and defensively talented shortstop who hasn’t hit much to date. What’s he really worth? Because that’s unknown, I think Segura stays put. This entry was posted in Trade Talk and tagged Adam Lind, Aramis Ramirez, carlos gomez, Gerardo Parra, jean segura, Jonathan Broxton, Jonathan Lucroy, Kyle Lohse, Milwaukee Brewers on July 13, 2015 by Justin Schultz. If you’re a regular reader of this site, you know I have an unhealthy obsession with Mike Fiers. And you probably know that even though his season didn’t start off overly well with his high ERA and all, I maintained my position; Mike Fiers is quite good. Much of Fiers’ poor performances had to do with his bad luck. Yes, I’m blaming luck. The guy is a strikeout pitcher, meaning he should generate weaker contact than a pitcher who doesn’t rack up the punch-outs. Weaker contact means less base hits. 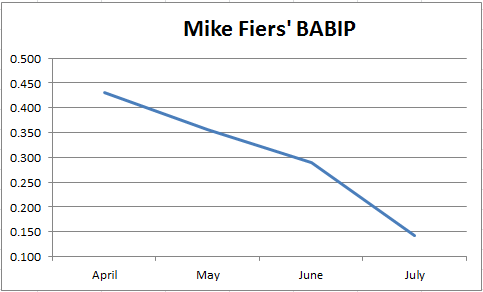 But up until his last handful of starts, hitters were finding holes everywhere, and Fiers’ BABIP was through the roof. Now, however, it’s starting to normalize, and his stats are starting to take notice. His bad luck wasn’t going to last forever, but if there’s still doubters out there who refuse to jump on my Fiers’ bandwagon, I’ll leave you with this. How Mike Fiers ranks in MLB: ERA: 55th (3.83) FIP: 47th (3.66) xFIP: 59th (3.89) SIERA: 47th (3.75) All in all, he’s been a solid starter. This entry was posted in Short and Sweet and tagged BABIP, Mike Fiers, Milwaukee Brewers on July 4, 2015 by Justin Schultz. After each (most, at least) weekday game, I’ll write a short but of course exciting recap of said game. Then, you the reader, will have the opportunity to give the Brewers a grade based on their performance. Simple enough, right? Free baseball! Matt Garza (5.52 ERA/4.99 FIP) and the Milwaukee Brewers went for a four-game sweep against Chad Billingsley (6.75 ERA/5.21 FIP) and the Philadelphia Phillies on Thursday. Garza gave up his 17th home run of the season, but even though he allowed double-digit hits (10) and four runs, he still managed to finish six innings. Plus, he fared a bit better than Billingsley, who was pulled after five. Jean Segura (2.7 BB%) knocked in two runs while collecting two hits. The Brewers bullpen blew a 7-4 lead in the seventh inning as Jonathan Broxton‘s high BABIP (.373) plagued him again. He managed to get just one out and was pegged for two runs. The game played 11 innings, but the Brewers squeaked out an 8-7 victory. The play that made the game worth watching: Gerardo Parra makes a terrific sliding catch to rob Maikel Franco of a hit. Stat of the day: Carlos Gomez was the only starting position player on the Brewers without a hit. Garza wasn’t on his game (again) and Broxton struggled, but the offense never let up. It was a nice four-game sweep. This entry was posted in Uncategorized on July 2, 2015 by Justin Schultz. After each (most, at least) game, I’ll write a short but of course exciting recap of said game. Then, you the reader, will have the opportunity to give the Brewers a grade based on their performance. Simple enough, right? Kyle Lohse (6.28 ERA/5.09 FIP) actually won a game, beating out Aaron Harang (3.56 ERA/4.00 FIP). Harang could barely get an out as he gave up eight runs on 14 hits in five innings. In all, the Brewers accumulated 17 hits, and found out there is actually a team they’re better than. Milwaukee won the game 9-5, their fourth-consecutive victory. The top four hitters in Milwaukee’s lineup combined to go 9-for-19 with seven runs batted in. Scooter Gennett (.246 OBP) led the way with two doubles and a triple, but had another fielding error. The play that made the game worth watching: Adam Lind mashes a two-run homer in the first inning. Stat of the day: Lohse went 3-for-5 at the plate, raising his wOBA from .106 to .183. Lohse actually pitched OK and the offense destroyed Harang. Give ’em an A. This entry was posted in Grade the Game and tagged Aaron Harang, Adam Lind, Kyle Lohse, Milwaukee Brewers, Philadelphia Phillies on July 1, 2015 by Justin Schultz.